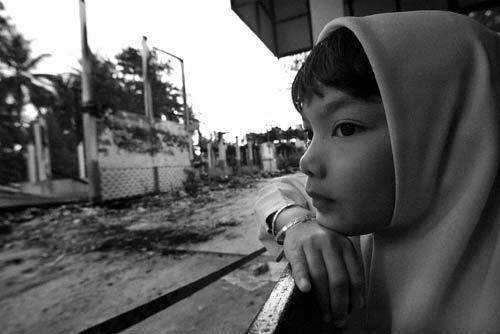 A Thai Muslim girl looks at her classroom in Muang Narathiwat school, which was burnt down in January 2004 by a group of unidentified assailants. They set fire to eighteen schools and attacked a military armory, killing four soldiers, in almost simultaneous raids in Narathiwat province 805 kilometers (500 miles) south of Bangkok. About ninety per cent of Thailand's sixty two million people are Buddhist. The Moslem minority is concentrated in the southern provinces of Pattani, Yala, Narathiwat, Satun and Nakhon Si Thammarat.